The Friends of Music at St. Mary of the Hills sponsors concerts. To receive the latest information about upcoming events, please follow us on Facebook @ Music from St Mary of the Hills. The primary function of the parish choir of Saint Mary of the Hills is to provide music and liturgical leadership for this parish. The choir presently comprises around 25 members and sings year-round for Sunday Mass and seasonally for Evensong, as well as for most of the major feasts of the Church throughout the liturgical year. Substantial choral works, often accompanied by chamber orchestra, are usually sung upon the Feast of All Souls and preceding midnight mass on Christmas Eve. The choir has sung at liturgies and given concerts of liturgical music at nearby Appalachian State University and other local venues as well as across North Carolina, South Carolina, Georgia, Washington DC, New York, and in several English cathedrals. The choir of St Mary's has been in residence at Durham Cathedral in England three times, as well as at the Church of St Mary the Virgin, New York City, and has sung liturgies an concerts and liturgies at Ely Cathedral, Norwich Cathedral, and the Church of All Saints, Margaret Street, London. The choir also enjoys the honor of having represented North Carolina at the National Cathedral in Washington, DC for the first North Carolina Day there. The choir maintains the highest possible standards of performance. To this end, it has studied with some of the world’s foremost choral directors of several of the famous college chapel choirs of Cambridge University, including King’s (Stephen Cleobury), St John's (the late Sir George Guest), and Clare (Tim Brown). The Choir of St. Mary's has made a number of recordings in recent years. If you'd like to purchase a copy, contact the Church Office. Proceeds from CD sales benefit the parish's music program. Singers of all voice parts are always invited to audition with the Director. Please contact James Bumgardner. Every few years, the choir travels to England to study at Cambridge or to function as Durham Cathedral's regular cathedral choir for a full week, singing daily services and high mass on Sunday in the fantastic millennium-old cathedral. The choir has a passion to experience more and more music from the Anglican tradition, and to make that music with the greatest skill, insight, and depth of feeling that can be mustered. 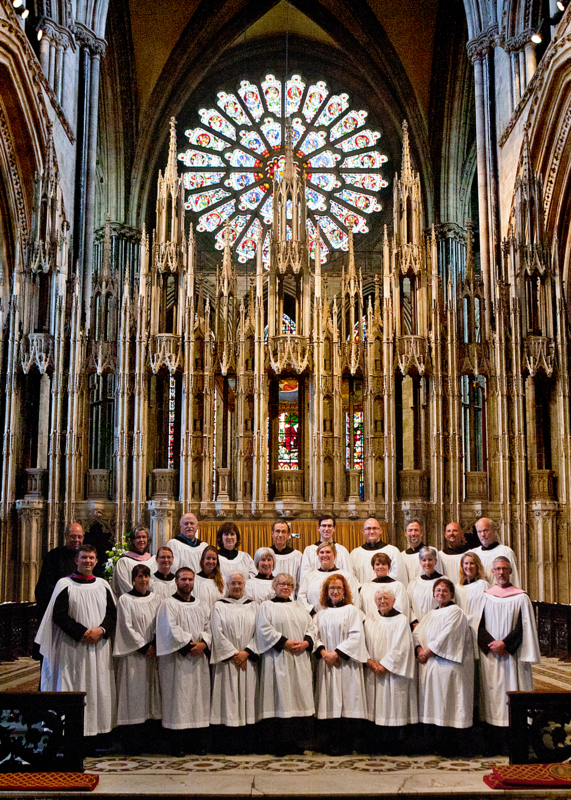 The choir last traveled to Durham, U.K. in July, 2015 for a week's residency. 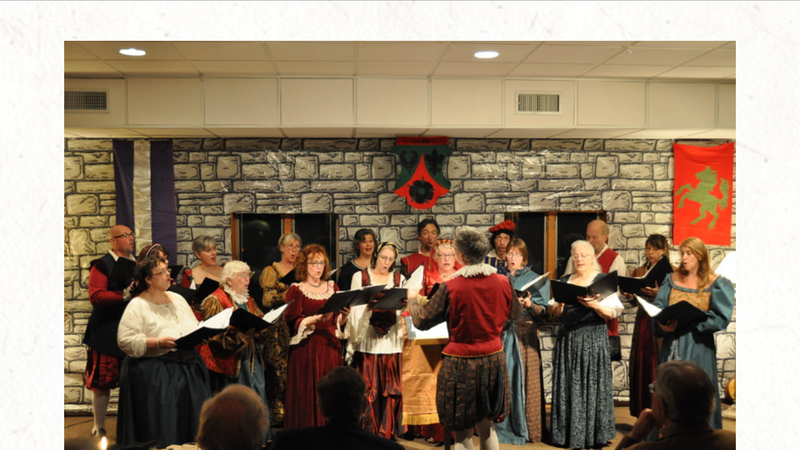 Residents of the High Country have a wonderful opportunity to get the holiday season off to a great start at the winter Madrigal Feast at St. Mary of the Hills. This December event combines superb food and drink with a mixture of madrigals and carols for a full evening's dining and entertainment. Madrigals, carols, and other entertainments from the 16th century and earlier are sung (and jested) during 4 delicious courses. The meal is prepared by one of the best commercial chefs in the area, and there is a non-meat, non-dairy option for vegetarians. Contact the Church Office for more information, schedule and ticket information. From May through October, the Choir sings Choral Evensong one Sunday a month at 3:30 pm, preceded by an organ concert at 3. We also invite you to enjoy this Anglican tradition by listening to the BBC weekly broadcast of Choral Evensong via the Internet. Each August, the choir of St Mary of the Hills past and present gather for a weekend of rehearsal and singing in memory of Dr. Ken McKinney, an internationally-known professor of Geology at ASU, who was the founder and a long-time member of the choir. The KenFest choir sings a Saturday afternoon concert as well as a fully sung mass on Sunday morning at 10.10 and evensong on Sunday afternoon at 3.30. * Ken was a passionate advocate for Social Justice and the Environment. Patterned on the familiar Lessons and Carols of the Advent season, the concert features readings and music from both sacred and secular literature that explore our place in the natural world, as well as our stewardship of and gratitude for all of creation. In 2019, MayFest date tba. *Mass and Evensong in August celebrate the Feast Day of St Mary the Virgin, our matronal saint. Following an extensive structural and acoustical renovation of the nave, a new organ built by Lively-Fulcher Pipe Organ Builders was installed in the summer of 2014. We are grateful to be the recipients of this fine instrument.